The sleeves on the Abram sweater are worked in the same manner as the front and back pieces. You'll begin with a provisional cast-on, work the hem facing (ideally in a jazzy contrast color), work a turning row, then knit the main part of the sleeve with shaping. And of course, you can customize your sleeve length with the custom calculators. If you like sleeves to hang down over your hands a little bit, add an inch or two to your Single Wingspan measurement. I want to share a bit about how this sweater and its sleeves are designed. Abram uses modified drop-shoulder construction. 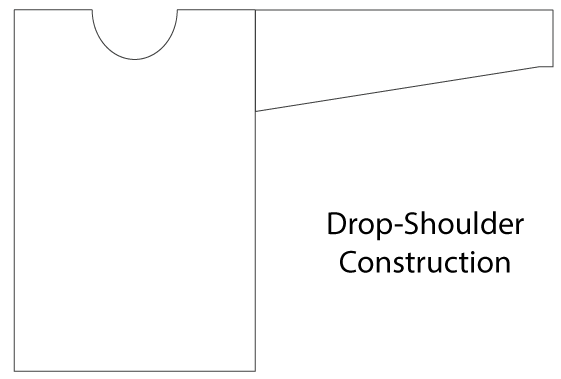 The most basic plain old drop-shoulder construction is a T shape, where a rectangular body meets rectangular arms. It's called "drop" shoulder because the body piece actually drops over the shoulder, with the sleeves attached beneath. It's a classic casual shape for a lot of cool sweaters, including many with oversized fits, plus Scandinavian ski styles like these vintage Spinnerin designs. But the major downside to drop-shoulder construction is that you end up with a bunch of excess fabric under the arms, which tends to get in the way unless the sweater is quite oversized. So some smart folks a long time ago decided to nip out a notch of that fabric, inventing what we now call modified drop-shoulder construction. It's got the casual ease of a drop-shoulder sweater, but with less underarm bulk. Here's what your modified-drop-shoulder Abram pieces will look like before you seam them together. Once you've completed the Front, Back, and both Sleeves, you're ready to block! There are detailed instructions for wet blocking in Handsome, but I'll add some extra bossy tips here. PIN. Pin your pieces into shape as they dry. Wool fibers like to snuggle up together as they lose moisture, so your pins (and blocking wires, if you use them) are the only things keeping your pieces to the measurements you ultimately want. MEASURE. Measure every part of every piece, to make sure you pin it into a size and shape that matches the schematic and/or your custom measurements from the calculators. HAVE PATIENCE. Let the pieces soak in lukewarm water for a full 30 minutes. Take the time to squeeze out all the water you can. And let them dry fully before you remove them from the blocking board. I used Jill Draper Makes Stuff Rockwell yarn for my Abram sweater. As I mentioned in Part 1 of the knitalong, it makes a pretty firm fabric at this gauge, so my finished sweater pieces are woolly and thick and crisp as h*ck. I can't wait to seam them up!